And what a journey it has been. From putting Waco (and shiplap!) on the map, to creating a Magnolia Home empire complete with a restaurant, Target line, and multiple books, the Gaines family has blessed us with down-home charm, a can-do attitude, and a bevy of dreamy design inspiration. Although we’ll miss inviting the dynamic duo (and arguably cutest couple ever?) into our home on Tuesday nights, their infectious personalities and fresh eye for style will live on in their stunning home transformations. In honor of tonight’s series finale, we’ve rounded up a few of our favorite design moments from the farewell season. Who’s ready to watch reruns with us? If you watched this episode, you know Chip and Jo went through a lot to get this fantastic original antique door in just the right place. But their efforts were worth every bit of extra elbow grease. The funky, multi-colored stained glass adds unique character to the entryway and is a cool ode to the home’s historical origins. This season, we’ve seen a real cutback on the use of the subway tile trend, with Jo opting instead for more geometric backsplashes. This one in particular creates a focal point for the open floor plan kitchen and feels both luxe and unique. Episode 6 was Joanna’s favorite home reveal, and for good reason. You can tell the level of love and detail she put into creating her sister’s dream home—right down to the light fixtures in the kitchen and dining space, which are show-stoppers themselves. Wallpaper has been enjoying a prolonged moment in the spotlight, and this subtle black and white print proves that adding a pattern to your wall doesn’t have to be overwhelming. We love how this one draws the eye upward and makes the room feel bigger. Bring on the bold hues! 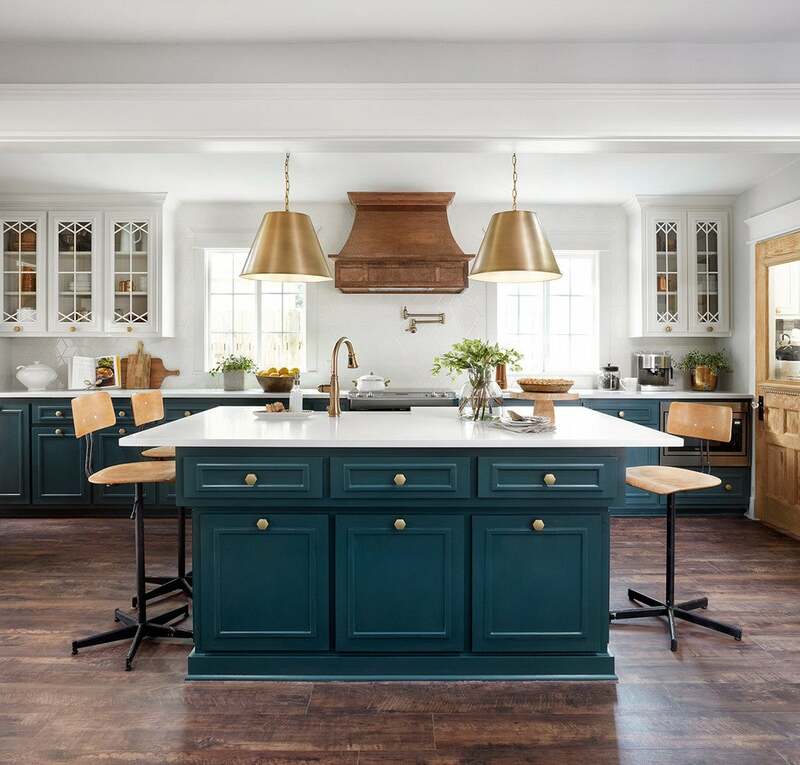 Since 2018 is all about embracing more vibrant colors, these blue-green kitchen cabinets are perfectly on-trend. In order to keep the balance of the space and not have the room be overwhelmed by the deeper shade, Jo chose to leave paint the upper cabinets white. As a result, the whole area feels large and inviting. After uncovering a boarded up fireplace in this older home, Chip and Jo masterfully restored the exterior with cool patterned tile, adding a little extra charm to the master bedroom in the process. This has been the season of bookshelves. Jo has definitely mastered the art of built-ins that add a ton of character to homes, and this adorable playroom made with the clients’ grandkids in mind is a perfect example of a boldly beautiful place to house your books. Was anyone not almost moved to tears by this inspiring episode? Chip and Jo teamed up with the Tim Tebow Foundation to create a wheelchair-accessible home for a family with two boys who have special needs. We always look forward to what custom touch Joanna will put into each home, whether it’s a handmade table from friend and craftsman Clint Harp (who just got his own show, btw) or a special piece of art for the family. This sweet quote built into the shower is the perfect example of Jo going above and beyond. Chip and Jo managed to transform this 750-square-foot tiny farmhouse into the ultimate bachelor pad for their friend’s son by lifting the pitch of the roof, adding some cool glass doors, and painting the entire thing a moody shade of navy blue. The result is a masculine mountain house that looks like it belongs on the slopes in Colorado.